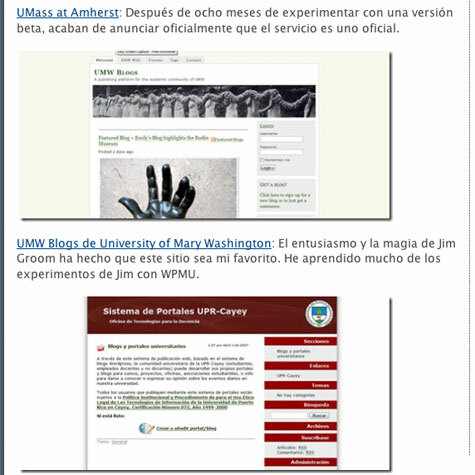 Mario A. Núñez Molina did some research on Universities that are using WordPress Multi-User in this post. There are at least ten colleges and universities on that list that I wasn’t aware of before reading the post. Something that is extremely exciting for me, because there are far more universities experimenting with WPMu than I originally thought -though not nearly enough. If you don’t read Mario’s blog, you really should. Not only is he as prolific as they come, but he has his pulse on the world of education and technology like few other blogs do. Nonetheless, he really doesn’t need anyone promoting his blog for him because his readership seems far more extensive than most other EdTech blogs I read on a regular basis written in English. Which raises a question for me: how important is it to starting reading blogs from other cultures written in other languages. I have gotten so many resources, tips, and possibilities from tapping into Mario’s blog, which has opened me up to a whole other world of Educational Blogging that I would have not had access to otherwise. And while my Spanish and Italian are worse than rough, when I saw all the cool things that they are doing I was immediately driven to see the innovations happening on a broader international stage than just Canada, the US, Britain, and Australia. In fact, I have been using my rusty language skills more than ever before. In fact, at the Open Education conference I met a great guy and absolute EdTech maverick (thanks you Brian for introducing us) in Pedro PernÃ­as Peco from University of Alicante in Spain. Pedro is hot on the trail of EduGlu and is doing and unbelievable job with making RSS do his bidding, if you haven’t heard his talk from Open Ed 2007 here, be sure to check out his awesome slides as well. Otis College of Art and Design is one of my personal favorites. Sue Mayberry has done an unbelievable job at Otis and needs to be applauded. The policy and the documentation is wonderfully done. And, as with most things from Otis, it looks so good! Keene State University has recently introduced WPMu into their learning environment, thanks to the inimitable Mike Caulfield. Expect much more from these folks. The University of Richmond has some WPMu action stewing in the pot, it may have been recently released, though I don’t have a URL for this one just yet. Any help? Update: The College of William and Mary is now running WPMu, and these cool cats are even hosting it externally, very cool! I just wish they would open up the comments on the front page so I could tell them as much. This entry was posted in UMW Blogs and tagged blogs, OpenEd, opened2007, spanish, unique, universities, wordpress multi-user, wordpress mutli-user, wpmu. Bookmark the permalink. I agree that the first meetup should be online, but what are the odds we could WP to sponsor a formal conference on the subject? Related note: I have a NERCOMP call for presentations in my email, due by Nov. 5. I wonder if WordPress would be interested in sponsoring this. Most of there presence at conferences has been through invite, as far as I can tell. And I am not sure if they have the resources and/or the inclination to host such a conference in conjunction with educational institutions. In fact, I would be interested to see how they feel about the educational realm of blogging, they have nodded to edublogs and Harvard Blogs here, but I have not seenor heard much from the WP crew about educational blogging otherwise. Very cool! I would love to work on this with you, and if the conference is reasonably affordable, I could possibly make it up to the North East. I think my travel money has dried up already, and I am going to lobby hard for Northern Voice 2008 (or just do it myself), otherwise I think I am on my own, we are having to tighten the belt as the new budget cuts take effect. Okay, maybe they could just give us some free t-shirts. How cool would it be to host the first WPMU Campus Conference? It would be extremely cool! Come next month, Baruch College, CUNY will be rolling out WPMu and following your prolific example. Go CUNY, get busy, it’s your birthday! 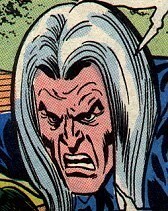 You vill be added to za list.